Think Beyond the Classroom. Think Beyond Training. Think Results. Your Training Investment. Your Way. Learning Tree offers breadth and depth of content that today’s businesses require to address technology and interpersonal skill development. The tuition for individual consumption is based on content, market and courseware requirements. Content categories range from Learning Tree developed (non-certification), Learning Tree developed (certification exam prep), and 3rd party partner. For government and qualified federal contractors, your tuition is also displayed on each content page per the appropriate contract schedules. Explore our catalogue offering to find the right content and delivery format for you (or the team members you’re seeking to secure training for), or contact us to discuss your individual development plan and we’ll design a learning path appropriate for your learning objectives. Volume purchasing power is straight-forward – there really is no need to explain ‘the more you buy, the more you save’. There is, however, a valid reason to describe how Learning Tree is committed to client-driven solutions that help you lock-in your training budgets without having to commit to a “traditional classroom-only plan” at the time of purchase. this Training Savings Account concept is simply a more flexible Voucher plan that accounts for more than the traditional 1 voucher = 1 course attendance, factoring in content- and delivery-format-based tuition. 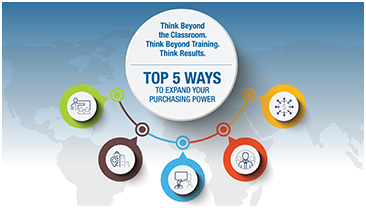 this Training Savings Account concept helps expand your purchasing power to modern blended solutions and services that are completely customizable based on your unique real-world challenges. We don’t believe in one-size-fits-all. Your Unique Needs, Your Customized Savings Plan, Your Real-World Results. Contact us below to outline your specific requirements for a customized response. Our Account Management Team can also share real-world samples of applied FlexVoucher Programs to help visualize real-world value. *Pay-As-You-Go FlexVoucher Programs are available with different terms, please contact us for details. Do you need curricula design, development in multimodal delivery? Do you need a full lifecycle solution for workforce optimization support? How important is it that your partner convey the right internal understanding of your mission and needs? Do you require global program management capabilities? How important is it that your partner have proven expertise in change management? Employees of all federal, provincial and local governments, plus qualified federal contractors are entitled to receive flexible training options and government-exclusive savings from Learning Tree. If you are not 100% satisfied, you pay no tuition!